Location: First site on the viaduct above Rouel Road, second site north side of the viaduct off Priter Way. Present state: The former entrance in the arches below the viaduct survives on the south side of Priter Way, the arches are in light industrial use. The wording 'SE & CR' and 'Booking Office' is still visible in embossed concrete above two of the entrance doorways. 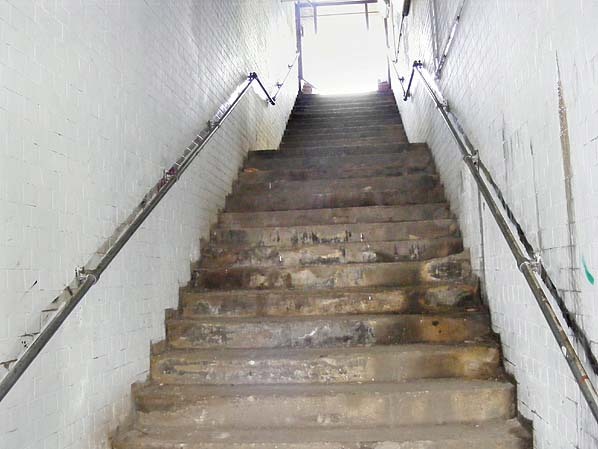 The booking office has been largely stripped but one set of steps up to the platform has been retained and maintained for rail maintenance and emergency egress from the line above. 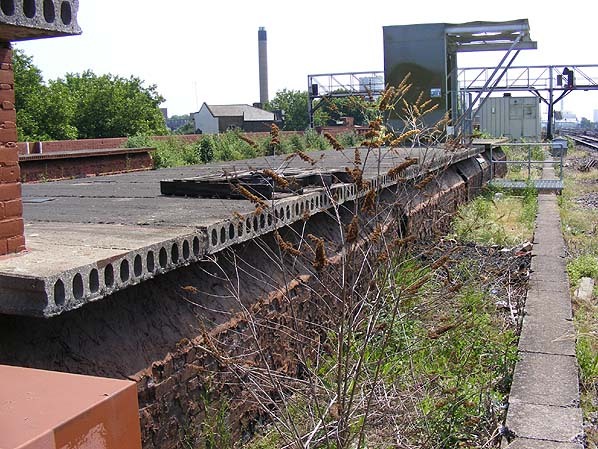 Some sections of both island platforms still survive. Notes: In 1833 an Act of Parliament granted the London & Greenwich Railway (L&GR) the rights to build a 4 miles viaduct from the south end of London Bridge to Greenwich and to run trains along it. However, the line was partially opened to the public well before its full length had been completed in order to maximise revenue income as soon as possible. 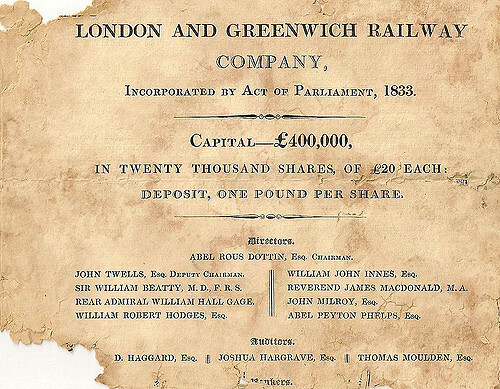 Other companies were in the process of building their own railway lines and the L&GR wished to gain the commercial advantage of being the first to open for business. Another consideration was the company's stock price, which stood high at the end of 1835 but was at risk of falling if the line was not soon opened. The board decided to open a 2.5 miles stretch from Spa Road to Deptford. 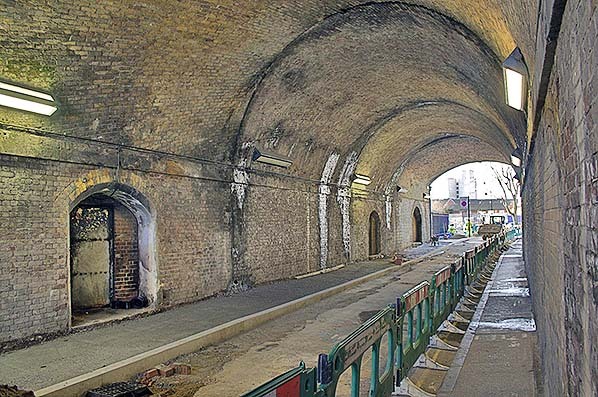 Spa Road was a temporary terminus during the completion of London Bridge Station. The first train left Deptford railway station for Spa Road at 8 am on 8 February 1836. Trains ran hourly on the half-hour from Spa Road, from 8.30 am to 5.30 pm, with a fare to Deptford costing 6d. There were no services after dark, as there were no signals on the line and it was not illuminated. The station was, in fact, the first London terminus albeit for less than a year. The 1854 map (right) shows the original station located north of Spa Road on the edge of an urban area. Spa Road station was within the parish of Bermondsey, which was then an industrial and working class area. From there the line crossed over marshes and market gardens to reach Deptford and Greenwich. The station itself was very basic. It was squeezed into a narrow space on a two-track viaduct with no room for buildings of any sort. The company did not even refer to it as a station but as a 'stopping place.' The platforms were accessed via wooden staircases on the outside of the viaduct, the one on the south side having a small wooden hut at the bottom for issuing tickets. If the platform was full, passengers were supposed to queue on the steps to wait for the trains. In practice, though, they often queued on the track itself. The company had not originally intended to provide platforms at all and had fitted its carriages with steps to allow passengers to board from track level, but found that low platforms were more convenient. The Commissioner of Pavements required the L&GR to maintain the staircases and to provide at least two services a day from the station. Perhaps not surprisingly given the station's physical limitations, only a month after it was opened there was a fatal accident when passenger Daniel Holmes was run over by a train. The other passengers had been waiting with others on the track when the Deptford train arrived. They climbed up on to the platform but Holmes remained on the track. The engine driver, Thomas Millender, was distracted by Holmes and collided with the waiting southbound train. A number of passengers who had already boarded the southbound train were injured and Holmes was killed instantly when Millender's runaway engine struck him. The duty policeman only just escaped also being struck and was dismissed for failing to warn the passengers in time. The accident was witnessed by George Walker, the L&GR's Resident Director, who subsequently wrote of the difficulties that his staff experienced in keeping people off the tracks. The L&GR opened the line between London Bridge and Spa Road on 14 December 1836. Usage of Spa Road station dropped significantly after the opening of London Bridge railway station, and drivers began to go straight through without stopping if they had no passenger requests. This changed in March 1838 when the company's directors ordered trains to stop at Spa Road hourly throughout the day and reserved half a carriage for passengers to and from the station on Sundays and holidays. They also took steps to improve access to the station. Despite this, it was little used and in late 1838 the L&GR's directors decided to close the station. It was boarded up at the end of 1838 and remained out of use until 1842. The line was further extended southwards to its final destination at Greenwich on 12 April 1840. 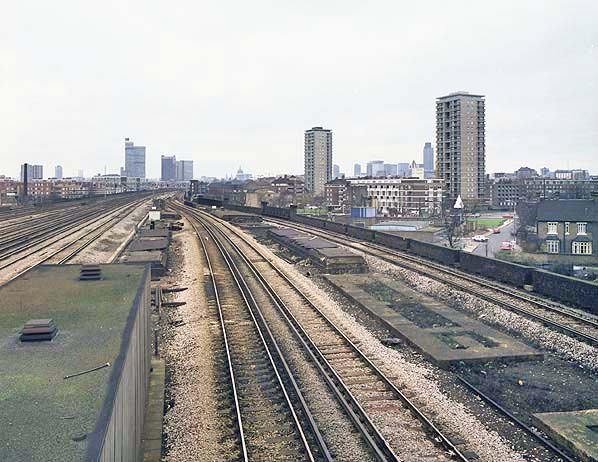 The railway was was planned with extensions in mind and the line into London Bridge was used by other companies as a route into London, these included the London & Croydon in 1839 and the London & Brighton in 1841 and the South Eastern Railway in 1842. In 1840, the L&GR applied to Parliament for powers to widen the viaduct, which was so narrow that the carriages only had a clearance of about 20 inches between their sides and the parapet wall, and about 3 feet clearance in the centre. There was no room for buildings of any description anywhere on the line. 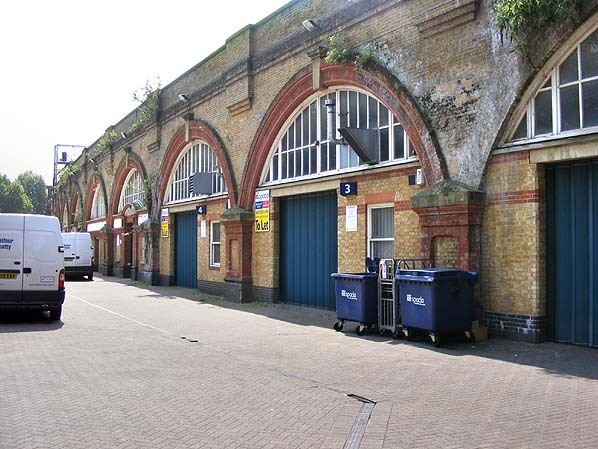 The company came under pressure to reopen Spa Road station, as competition from the railway had caused the demise of a horse-drawn coach service from Bermondsey to Deptford. It agreed to construct an improved station when the line was widened. 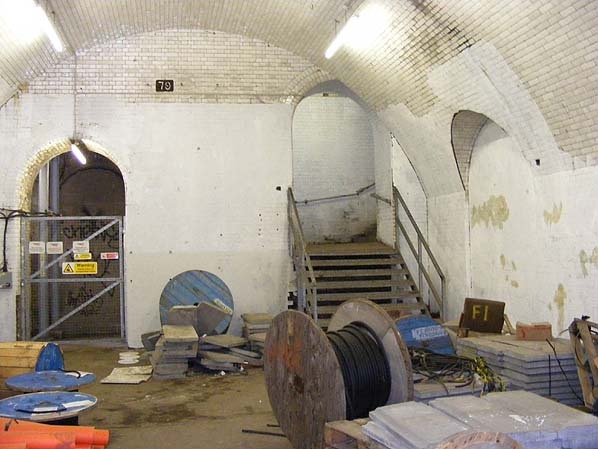 This involved moving the access staircase to the north side of the viaduct, building a waiting and booking office room in the arches and constructing a shed over the line. A local contractor, Thomas Jackson, began work on the new station in June 1842 and it opened in September, with the work costing £450. The following February another life was lost at Spa Road when a man named Birmingham suffered a fatal injury in the station. This 1872 map (left) shows the larger second site which was located south of Spa Road surrounded by fields. The station was upgraded in August 1843 when signals were erected there, and in May 1844 the platforms were extended. To help cover the cost of the widening tolls were increased which forced the Croydon and South Eastern companies to consider building a rival terminus at Bricklayers Arms to avoid the Greenwich viaduct. To counter this, the Greenwich company agreed to lease their line to the South Eastern under an Act of 1845. The South Eastern Railway took over the L&GR the following year and rebuilt the whole station again. The reconstruction work, which took place in March 1845, saw the demolition of the stairway and the building of a new internal stair approach from an arch in West Street (now Marine Street) next to the arch occupied by the booking office. The tracks were relaid to make them diverge slightly, providing room for an island platform about 10 feet wide. A small shelter was constructed there with a roof 12 feet above track level and projecting about 8 inches outwards, level with the sides of the carriages. A third-class passenger was killed on 1 April 1850 when he climbed part-way out of his open carriage and hit his head on the shelter's projecting roof as his Greenwich-bound train passed through the station. A subsequent Board of Trade enquiry recommended that steps should be taken to ensure that the 'unruly class of passengers" found in third class should not have the "power to injure themselves" in future. 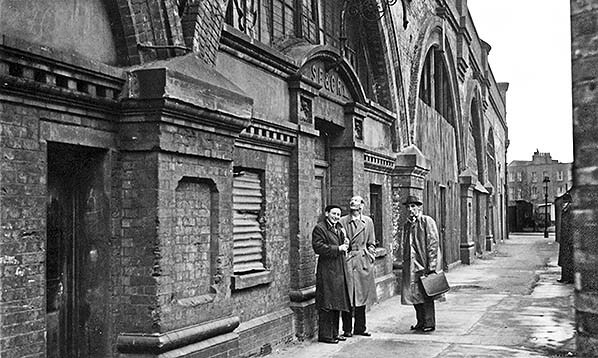 In the same year, a small shelter for ticket collectors was erected on the Spa Road platform and trains to London Bridge were stopped there to carry out ticket collections before arriving at their destination. This arrangement continued until Charing Cross railway station was opened in 1864. "Gangs of children made it a practice, especially on summer evenings, without any apparent hindrance from the police, to attend every train and, standing at the junction of Rouel Road with Frean Street, to shout in chorus with a sort of cadence, "Throw down your mouldy coppers!" ... The chorus was repeated incessantly until the train moved on, unless coppers, mouldy or otherwise, arrived and then there would be a glorious tussle of boys and girls in desperate strife for the prize. Coppers were often thrown; if one passenger started and so afforded others a specimen battle, another was almost certain to follow and he, very likely, would be joined by a third, all perhaps in different carriages. When a train resumed its journey [the children] would play about in the neighbourhood until the next drew up." 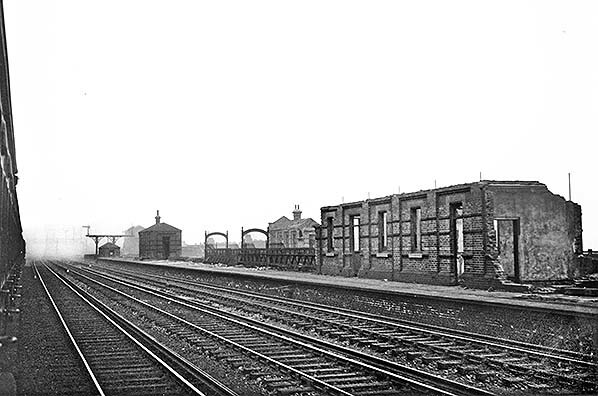 In 1867 the station was resited further along the viaduct about 200 yards to the east, with an entrance accessed via what is now Priter Road. 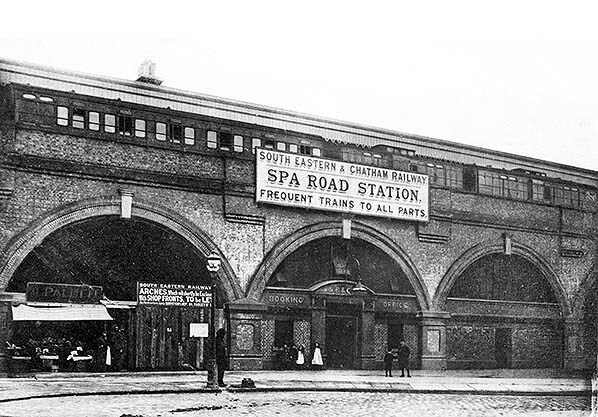 It was renamed as Spa Road & Bermondsey in October 1877 althought the c1904 photo reproduced below shows that it was still advertised as 'Spa Road Station'. When the South Eastern and Chatham Railway was formed in 1899 from the South Eastern Railway and its bitter competitor, the London, Chatham and Dover Railway, the station was given another makeover. The current appearance of the station frontage dates from 1900. The station was provided with two island platforms on the north side of the viaduct. Each platform had a brick building and a canopy. A signal box was located at the north end of the down platform. On 15 March 1915, the station was closed, along with Southwark Park and Deptford stations, as a wartime economy measure. Only Deptford was subsequently reopened. Spa Road continued to be used by railwaymen until September 1925, when it finally ceased to be used by the railway. By the mid-1980s the old station had fallen into dereliction. It had lain empty for many years and the vacant land in front of it had become a site for the illegal dumping of rubbish. In 1986, British Rail, the Southwark Environment Trust and the London Borough of Southwark contributed £50,000 to restoring the station frontage and installing two commemorative plaques. The station arches and the land in front of them were redeveloped into a light industrial estate behind a housing block, accessed via Priter Road. Parts of the station still exist; platform remnants are visible from trains travelling between Deptford or New Cross and London Bridge, and can easily be seen in satellite images. The frontage of the station is still extant and displays the signage of the South Eastern and Chatham Railway. The site of the ticket windows is also visible. The disused platforms can still be reached via the old ticket office and have occasionally been used in emergencies. On 8 January 1999, after two commuter trains collided and derailed in the Spa Road train crash, some passengers were evacuated through the old station. 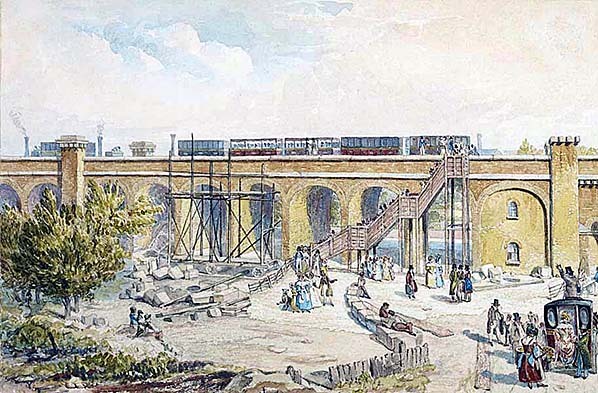 The first Spa Road station in 1836. Built during an era when station design was still in its infancy, the original terminal was very basic indeed, consisting of two narrow timber platforms connected to the street below by a rickety wooden staircase. The ticket office was at street level and, as the image illustrates, passengers were often required to queue on the stairs whilst awaiting their train. 1934 1:2,500 OS map. Although this map was published in 1934 it is a 1915 revision of the 1870/71 survey. It still shows the station although by this date it had been closed for 17 years. The platform buildings are clearly shown. Spa Road Station forecourt in C.1904. 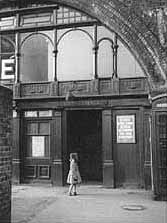 Although the station was called Spa Road amd Bermondsey the prominent sign about the entrance to the booking office only shows Spa Road. The original Spa Road had only narrow timber platforms. The third station seen here had wider platforms with brick and canopies. Spa Road Station in April 1926 seen from a passing train. 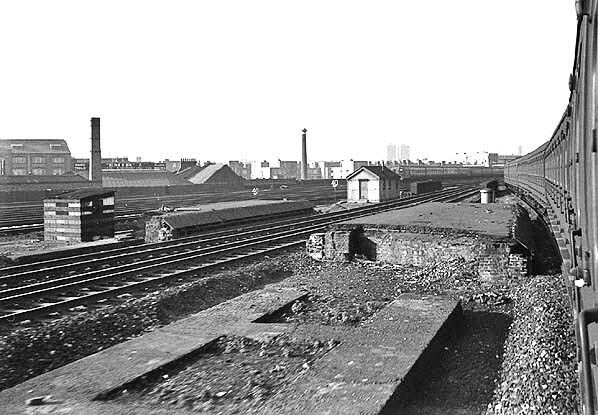 The canopies have been removed but the platform buildings were still standing. The signal box can be seen at the end of the platform. SRailway arch at Marine Street, just north of Spa Road. 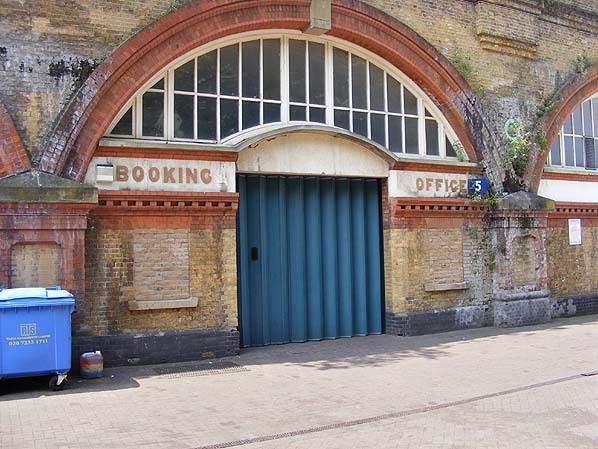 The two iron doors on the left gave access to the ticket office of the 1842-1867 station and the platform.